Liverpool suffered a huge blow on Friday when Daniel Sturridge was ruled out for at least three more weeks after suffering another injury in training. Manager Brendan Rodgers had been hoping the striker’s return to fitness would be a boost to his faltering side. Now Sturridge, who injured his calf during a warm-up at Melwood on Thursday, will miss a number of crucial games, including home and away Champions League group games against mighty Real Madrid. Liverpool have seven games in the next three weeks, including a last 16 Capital One Cup tie against Swansea on October 28 and a Barclays Premier League clash against Chelsea at Anfield on November 8. 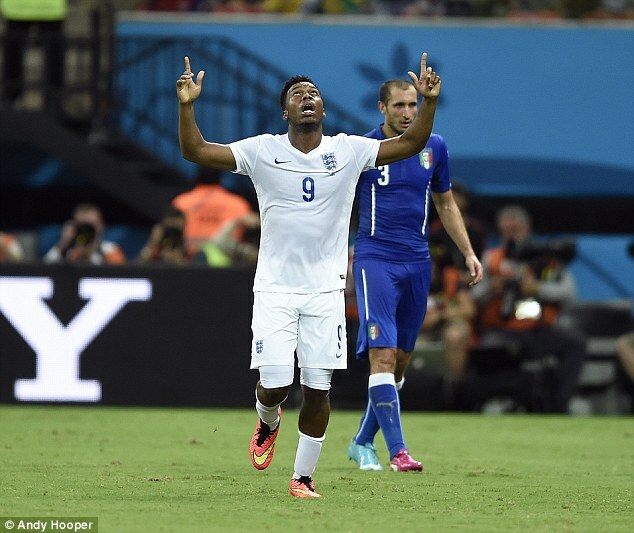 Sturridge was recovering from a thigh problem suffered on England duty in September. The injury led to a rift between Rodgers and England manager Roy Hodgson over the striker’s recovery schedule. Despite Rodgers doing his best to play it down on Friday, lingering bad feeling remains, after Hodgson suggested that the Liverpool manager’s practice of having a two-day recovery period for players after games is a waste of time. 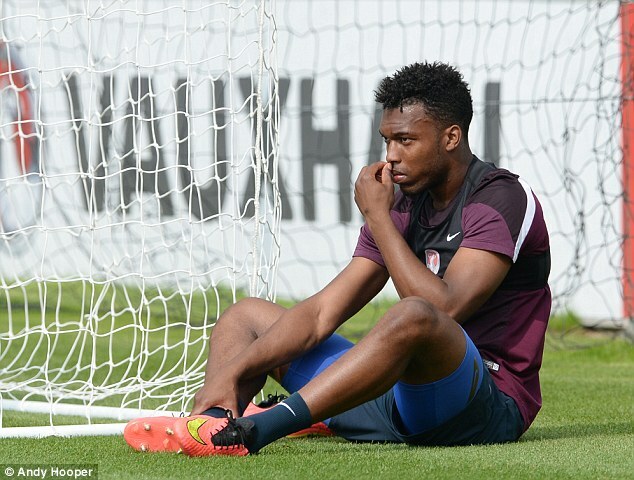 Ironically, Sturridge could be fit just as Hodgson is building up to England’s next Euro 2016 qualifying game against Slovenia on November 15. The fall-out from the last Euro 2016 tie continued on Friday with Rodgers suggesting that Hodgson failed Raheem Sterling by revealing publicly that the forward had admitted to feeling tired ahead of the Estonia game. According to the Anfield boss, Sterling, who is in Liverpool’s line-up to face Queens Park Rangers, returned to Merseyside this week shaken by the furore surrounding his omission from the England team. Rodgers believes Hodgson should have kept the conversation he had with Sterling in the build-up to the game private and hinted that he feels the England boss needs to learn a lesson. Rodgers said: ‘Every conversation you have with a player is private. ‘That’s how I work and I am sure Roy will probably look at this episode going forward and analyse where he can be better on it. ‘I’m sure when they [Sterling and Hodgson] meet up next they will speak on that and clear that up. The Liverpool manager is incandescent that some people believe Sterling actually asked not to play for England last weekend. Asked if the FA should have clarified this, Rodgers said: ‘Maybe. I can’t control what he [Hodgson] says or thinks. ‘What has been disappointing and grossly unfair is how the kid has been on the back page for something he did not say. ‘He did not say he was not able to play. What he said was he felt tired, and what you do is take on board all the information and then make a decision. So you respect Roy’s decision not to play him. ‘Roy is a manager with great experience who has been around the game long enough and all managers deal with situations differently. ‘But I have one thing to clear up. I have seen a lot written about the second-day recovery. ‘People think Liverpool players are at home on day two with their feet up watching Sky Sports. That couldn’t be further from the truth. ‘My belief and training model is to make players better. Part of that is recovery as my game is about pressing and playing at a high physical level. Our second-day recovery is technically a session. The space we play in is very small to reduce the intensity. ‘That has worked for me all the way through my life and has kept players fit and fresh. ‘That has helped people here like Steven Gerrard to play as many games (as he has). Recovery is vital, physical and mental. I take great pride in it and give it a lot of focus. This week former Liverpool players Jamie Carragher and Michael Owen have suggested it was unusual for a player to give a manager an excuse to leave him out by admitting he was tired. Rodgers said: ‘The speed of the game is different even to what it was five years ago. Players cannot play every game at the top level, in particular young players. If you put too many miles on the clock, you will break them and they will end up finished at 26 or 27. ‘What I’ve been really proud of in watching Raheem is his honesty and responsibility. Responsibility is for a 19-year-old boy to say he was tired. This is a kid who loves playing. He never misses a day’s training, the work ethic he puts in for his game is fantastic. He loves playing for England. 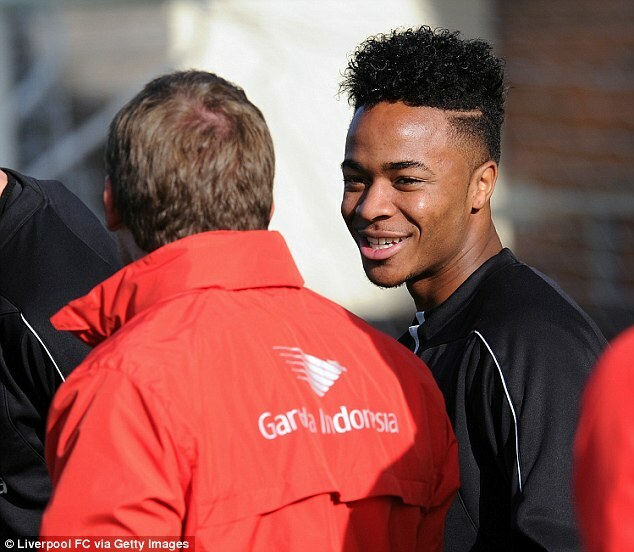 Rodgers also hinted he would have no problem with Sterling playing in next summer’s Under 21 European Championship. Arsenal joined in training by French Rugby World Cup stars and former Gunner Pires as they prepare for trip to Leicester Vive La France! Manchester United took 110 weeks to return to top spot in the Premier League... but can their current form last after fast start?